Ok, so this might be kind of an odd topic for a craft blog, but there’s a point. I went to breakfast with a friend this morning, which required me to take the infamous Long Island Expressway a few exits to meet her in the middle, infamous because if you have to commute on it on any given weekday, it’s torture. I know. I did it for 10 very long years. On Sunday morning though, until the Hamptons traffic starts to go home, it’s never that bad…most of the time. Then I took the LIE back east to go home and I noticed something that was so strange to me. They were closing off the westbound road, which I could only assume was for some kind of construction project because I didn’t see any horrible collisions. I didn’t notice any signs on the way in though. And here’s the odd part. The police at the exits were at the entrance to the LIE, not at the top of the exit ramp, where motorists would have known NOT to get on at all. Instead, at at least 4 exits in a row, there were state police right at the LIE entrance, and cars backed up into the ramp, maybe 10 or 20…poor suckers. And then, AND THEN… I saw where the main closure was at exit 60, and I was just floored. Because the cops were not blocking the road where the exit let off….they were quite a ways past it, and there were at least 100 cars, if not more (hard to count when you’re going 60 miles an hour in the opposite direction), all jammed up in 4 lanes between where they should have gotten off and where the cops had them trapped. There was no place for them to go, and there was no way, with the cars piling up behind them, they were backing up. I was so happy that I was going the other way. On a Sunday, the last thing you want to do is sit in traffic in 90 degree heat on the LIE. And let’s not mention the gas–oh the gas–to sit there with the car running for AC…Yikes! I’d really like to know what brain surgeon set up that traffic closure pattern and why not one of the cops didn’t think to go to the TOP of the exit ramps to avoid traffic jams. Anyway, if the brass or whoever is making the decisions had just used a little common sense, they could have avoided what may end up being a heatedly discussed topic in the homes of those who were trapped, and people like me shaking their heads in amazement the whole way home. The point of the story? Common sense. We all need to use it…in our daily lives, our business and on our websites and online stores. 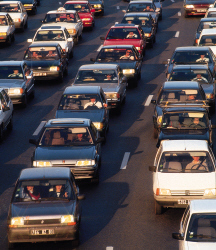 Consider the traffic patterns before you lay out your site…how do customers browse? How can you make it easy for them to press that button and buy from you? How can you prevent roadblocks? Have clear directions and make your site/store easy to navigate. Avoid roadblocks. If it’s not easy to drive, people won’t stay and they won’t buy from you. They’re not trapped on the Information Superhighway. Is my site perfect? Not on a bet. It’s pretty, but functionally, it’s clunky and I think difficult to navigate. I had a designer create it too fast (getting ready for a show), and I didn’t really know as much as I know now. I spent a sizable chunk of money on a website that I barely use. As soon as I have enough money to start over, I will be revamping that site. That’s why I love sites like eBay and Etsy. They make it easy to navigate, when you do make mistakes, they don’t cost an arm and a leg, and it’s a good place to start so you understand what’s needed when you do have your own site. I’m so glad I don’t have to go West on the LIE today!